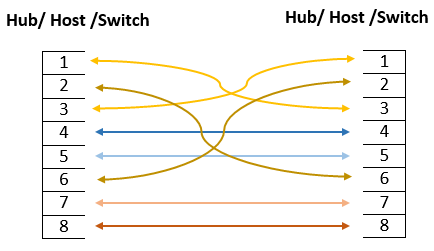 A network is made of several interconnected devices. The interconnection between these devices takes place using various media types. These media types could be wired or wireless. In this post we would discuss the wired media, but as wired media in it self is a very big topic and we won't be able to cover all of it in one Post so I am going to target the Ethernet Cables specifically, and promise to cover the rest of the topic in the upcoming posts. but before that i would like to name all types of wired transmission media and then we will continue our main topic. There are three types of wired transmission media which are also known as guided transmission media. for more information have a look to the following figure. 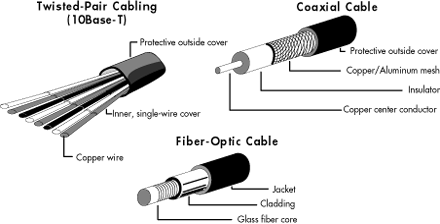 A twisted-pair cable is type of cable made by intertwining two separate insulated wires. There are two types of twisted pair cables. 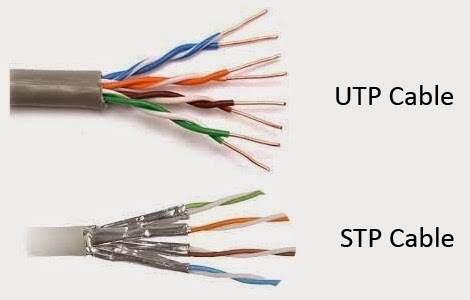 A Shielded Twisted Pair (STP) has a fine wire mesh surrounding the wires to protect the transmission; while the Unshielded Twisted Pair (UTP) do not have such protection. In above figure you can see that only pins 1,2,3 and 6 are used. just connect 1 to 1, 2 to 2, 3 to 3, and 6 to 6, and you'll be up and networking in no time. The same four wires are used in this cable as in the straight-through cable; we just connect different pins together. 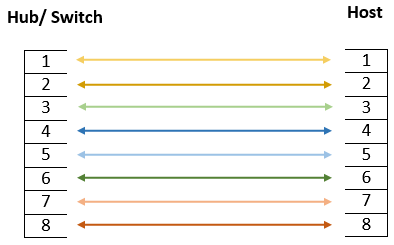 On the following figure is shows how the four wires are used in a crossover Ethernet cable. Notice that here we connect pins 1 to 3 and 2 to 6 on each side of the cable. Although rolled cable is'nt used to connect any Ethernet connections together, you can use a rolled Ethernet cable to connect a host to a router console serial communication (com) port with additional converter. if you have a Cisco router or switch, you would use this cable to connect your PC running HyperTerminal to the Cisco hardware. Eight wires are used in this cable to connect serial devices, although not all eight are used to send information, just as in Ethernet networking. 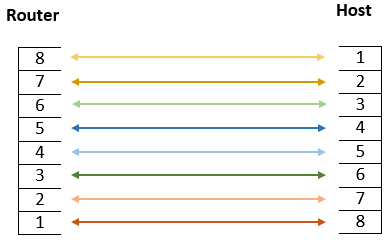 Here are the eight wires used in a rolled cable and their combination to be created. So here we have discussed the different types of guided transmission media, types of Ethernet cables and wiring combination of them. i hope you have understand a little bit about the Ethernet Cables. in the next post i will cover the other types of the guided media types. till then have nice networking sessions and please share your suggestions and objections by giving comments down here. Afghanistan Internet History – A Light on The lost part from the Taliban Regime.